Good morning, everyone. After an overnight lull in strengthening, perhaps caused by some dry air working its way into the circulation of Hurricane Harvey, the storm has begun intensifying again. As of 6am CT it had sustained winds of 110 mph, but with the central pressure continuing to fall, the storm’s winds will almost certainly increase. For Texas, there will be two epochs of Harvey: the catastrophic effects from wind and surge during the next day or so for the central Texas coast, and the unfolding, widespread, major flood event from Saturday through the middle of next week for a large swath of the state, including Houston. We will discuss both this morning. We remain confident in the forecast track for Harvey during the next 24 hours, as it moves northwest across the Gulf of Mexico, and comes ashore somewhere near Port Aransas. If you live in, or have property from Rockport to Matagorda, preparations for devastating winds—probably about 120 mph sustained, but maybe higher—should be completed by early this afternoon. National Hurricane Center forecast track at 4am CT, with probability of hurricane force winds (red high, green low). Also storm surge warnings are shown in red markings along the coast. Storm surge will be a major problem for low-lying coastal areas. According to the latest National Hurricane Center storm surge forecast, the following numbers represent the realistic “worst case” inundation. This means the depth of water above the ground. You can visit the site itself to zoom in to any location along the Texas coast. For Houston, aside from the above surge numbers, the effects from the immediate landfall of Hurricane Harvey will be relatively modest. As we’ve discussed, winds Friday night and Saturday morning should be manageable, although some areas may briefly see some tropical storm-force winds. The power grid is designed to withstand these conditions—so hopefully most of us will keep the lights on. After landfall, Harvey is forecast to move inland perhaps 50 or 100 miles, and then it loses all steering currents for awhile. The most likely scenario is that after wobbling around this weekend, Harvey slowly begins to move to the northeast toward the greater Houston area. It’s center may move back over water, or remain over land, but eventually it should get pulled into a trough over the northeastern United States. (Last night I mentioned the slim possibility of the storm stalling out in the Rio Grande Valley, and while I’m not entirely ruling that out, it seems less likely with this morning’s model guidance). All of this wobbling and slow movement and proximity to a warm source of moisture (the Gulf, and its bathwater-like temperatures in the upper 80s) will lead to very heavy rainfall and devastating flooding for much of the Texas coast and inland counties. We can’t say exactly where the heaviest rainfall will come (there may be some isolated areas that receive a Tropical Storm Allison-like 35 inches), but we can say with growing confidence that a large region will see 10 to 25 inches of rain between Friday and Wednesday. The following map represents the best effort by expert forecasters at NOAA to predict where the heaviest rains will fall during that time frame, and indeed it includes much of the greater Houston area. I do not believe it is an exaggeration, nor does it over-hype the threat. Harvey presents a grave threat to the Texas coast from Corpus Christi to Beaumont. 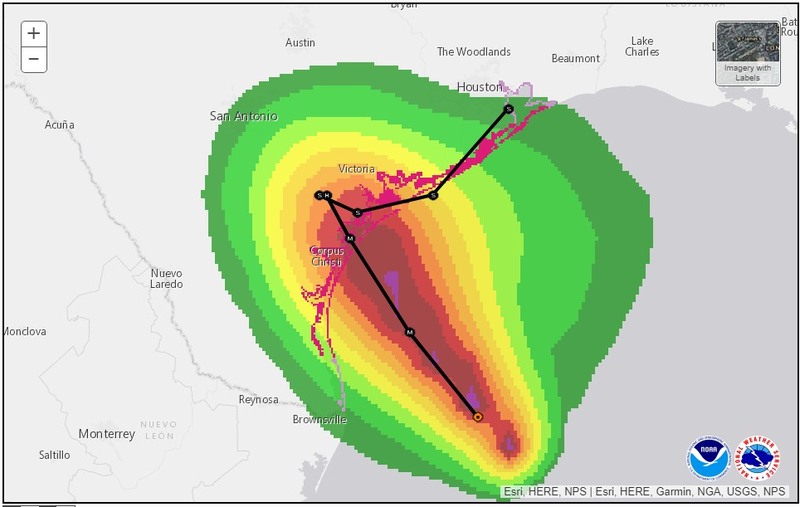 If you live along the central Texas coast heed evacuation warnings, make final preparations this morning, and prepare to endure what is likely to be the strongest hurricane to strike the region since Hurricane Celia, in 1970, or perhaps even Carla, in 1961. For Houston, effects from Harvey’s landfall today and Saturday morning do not appear likely to be dangerous in terms of wind and surge. If you have to work, or make last minute preparations for flooding, there is still time. The outer rain bands will bring precipitation to Houston today and Saturday, but as of now the forecast models show nothing too extreme through at least Saturday afternoon. This is likely the calm before the heavier rains move in later on Saturday night, and then in earnest on Sunday and Monday. The timing and amounts of heavy rain in Houston are not precise. But be prepared for flooding, and tropical deluges from Sunday through Wednesday. Many roads will become impassable. Homes will be flooded. It will be pretty miserable for a lot of people. We will update again before noon, today. Also, if you’re interested, I’ll be conducting a Facebook live event in conjunction with the Houston Chronicle at 11:30am. I also spoke with NPR’s David Greene early Friday on Morning Edition. Thank you for the timely updates! How do you expect the flooding in this event will compare to the tax day floods? Worse, because they will be much more widespread. Great reporting as usual. However, don’t forget the lessons of the past. There is a very real likelihood that the cumulative rains, spread out over several days, will not cause a great deal of disruption or flooding. This is clearly a serious event, but it is not unprecedented. With all of the notable problems with our infrastructure, we still have pretty impressive working flood controls in place. Believe it or not, I’m worried about lots of people heading off to bars/restaurants tomorrow night to see the Mayweather-McGregor fight. For that reason alone, it would be nice to see the city of Houston recommend only essential people to be on the streets by tomorrow night, Or is that too extreme a thought at this point? Thanks, Eric. Those of us in the Meyerland/Westbury area are pretty tense and appreciate the hype-free forecast. Right next to you and yes, I’m tense even though I did not flood in the most recent events like many others did. I’m also in Meyerland area. I’ve been able to escape water in the house the past 10 years. Previous owners said no water during Allison, but I am tense. thanks Eric, you are the calm, reassuring voice in a world overflowing with chaos. Do you think the severe rains will hit as far northwest as Cypress/Waller? Thanks Eric. Is Pearland (518 & 288) considered southwest Houston? When they say major flooding south of I10 is northern Pearland included in that? Thanks again. It is south of Houston, rather than southwest. Good Morning Eric and thanks again for the non-hysterical update! Just a quick question, I saw this morning that NWS Houston is saying that the rainfall total and flooding will be the worst south of the I-10 corridor. Do you think that is accurate? I am out-of-town and supposed to fly back Sunday arriving at 1. Any realistic chance I will make that flight to be with my family before the worst of of it ? I’m in this exact situation. Really wondering what the chances are that my flight will either be canceled beforehand or not allowed to land at IAH on Sunday at 1:00. Same situation; was supposed to leave this morning and then return Sunday. I just canceled my trip. Sad…but that is what is best for me and the family. For those of you that have flights that may be impacted, 6 airlines are already allowing free changes to flight schedules. If the flooding is going to be serious through the 30th, changing my flight does not avoid the natural disaster. Other airlines are more reasonable–I will be keeping that in mind next time I fly! Thank you so much for your tireless work to be honest without unnecessary hype. In theory, we are to load our family home on a moving truck for NC tomorrow at 9am. Any notes on how much rain will be happening then? Is everything going to get really soaked as we load? If we postpone, can we likely load and leave on Thurs? What should be our greatest concern in the Cypress area? We are scheduled to fly out Thursday afternoon from Hobby. Thoughts? Thanks, Eric. Still operating under the assumption that most of the greater Houston area shouldn’t see winds strong enough to knock down trees and destroy power lines? Maybe, but that’s a bit too speculative right now, and I’m not convinced Houston would be on the dirty side of the storm. I’m sending all my friends monitoring Harvey to your blog (and hopefully they heard your words of reason this morning on NPR) so they can get scientifically-based, accurate updates without the hyperbole and panic-creating words of fear that you sometimes hear on other outlets and certainly in social media. Keep up the great work and your updates are so greatly appreciated! Eric, is it safe to say that homes themselves outside the 500 year floodplain are unlikely to flood – though it’s likely that most people get flooded in as the roads flood? Eric, I am another Space City Weather newbie and can’t continue reading your thoroughly impressive play-by-plays without some words of gratitude. Thank you SO much for your hyperbole-free accounts of the facts and your extremely detailed (to a layman like me!) explanations of what to expect. Your lack of drama brings so much more credit to the reporting. I am so grateful for the work that you do! Thank you sir, again for your brilliant work. You are truly appreciated! Stay dry! Thank you, Eric!! We appreciate basing our decisions on your factual reporting. Stay safe yourself. Hopefully we won’t all have to use the Reliant generators! But if there is a spike in sales, we hope they’ll support expanding your coverage to the San Antonio area since so many of us travel the I10 path. Thank you again for getting us through this stressful time. Thank you for the details! I had plan on flying into Houston for a few celebrations tonight through Saturday and flying out Sunday. Based on the above do you agree that celebrations will be impacted and/or cancelled do to severe flooding? Would I be able to fly out of Houston Sunday afternoon? I would not be confident of flying out of Houston on Sunday. Thank you for preparing an update so early today. It promises to be a long day for you, but please know how much we appreciate the whole Space City Weather team! The feedback for this site has been gratifying over the last couple of days, and I truly appreciate it. Thoughts on bugging out? Does the “run from water” adage apply in the event of 30″ of rain? I would not evacuate unless you are in a low-lying area. But that is entirely your call. This may sound dumb, but if I am in a 4 story apartment in the Med Center, bugging out sounds dumb in your opinion? With the onset of Harvey I was astonished to find forecasters predicting 14 to 20 inches of rain without stating the length of time over which the precipitation would fall. 14 inches in one hour would flood most anyone, while 14 inches over 6 days is manageable. So it seems the worst-case prediction is 25 inches of rain over a 6-day period, or an average of 4 inches per day (i.e., 4 inches each 24 hours) which seems manageable if rainfall remains near the average. Am I being overly optimistic? Can it be predicted how “bursty” the rainfall be? Or will it be a long slow steady rain? You are being overly optimistic. This is tropical rainfall, and it will come at times in rainfall rates of 2-3 or more inches per hour. So is this storm worse than Allison (IIRC 35 inches over 5 days) as far as potential flooding damage? Does anyone track the dynamics of rainfall for various storms, something like an hour-by-hour graph of rainfall? Of course, this would vary by location but, again, if one has the data can produce dynamic maps that show average rainfall by day or even by hour. Talking about totals over 5 days doesn’t capture the full picture and is potentially misleading and alarming. And as I stated earlier, newscasters are, to my consternation and alarm, more and more frequently omitting _any_ reference to time interval in their reports. To do so is downright unprofessional, even if it does draw more eyes and ears to news media. Recall that there was a very wide distribution of rainfall from Allison, from >35″ in Eastern and Northern areas, to <4" in Katy. The record 42" rainfall that hit Alvin in 1979 from Claudette in 1979 was a highly localized. Nearby Houston did not receive nearly as much rain. We will get through this. The vast majority of us will do pretty well and be in a good position to help those who have problems. I agree Tom. There is a huge difference between 20″ over 1 or 2 days and over 4-5 days. I live in Cypress, where the creeks can usually handle large amounts of rain over a period of days. The only time they overflow is when we get 15″ in less than 6 hours. The problem in Cypress isn’t while it’s raining, it’s afterward. In the Memorial Day flood, a good 5 hours after the rain stopped the creeks overflowed and water came back up through the storm drains – that’s what caused our homes to flood. I also wondered why they don’t put in a back-flow preventer in the drains. My thoughts exactly!! I had friends who were absolutely freaking out since they flooded during the tax day flood last time. I pointed the NOAA info that said it was 20″ through Wed. They calmed down. Stating a qty with a time factor is very irresponsible. Thank you so much for the update. People keep texting me freaking out about what they’ve seen on the news. I calmly send them to your website. You are providing an invaluable resource for the city of Houston. Thank you so much! Thanks. Guessing incoming flights to IAH will be canceled on Sunday? Trying to decide if I should leave today for a planned event; scheduled to come back Sunday. I’m so very glad to have some one reasonable and responsible like you to depend on at times like these. Hopefully we’ll all make it through but this one sounds like the one you dread. Take care Eric and thanks for the hard work and long hours. What are our chances of catching an overseas flight on Wed. at 9pm? Too early to say? Any guesses? Any thoughts on the Alvin/Manvel area being flooded? Our subdivision flooded during Allison and Ike. Concerned because I have a disabled husband who is on oxygen 24/7 and we need electricity for that. Any thoughts would be greatly appreciated. Thank you. Hello. Yes, I’d be concerned about flooding again. I think the electricity will remain on for most people, but I can’t guarantee that. Eric, regarding wind for inner loop Houston…I have numerous potted plants in the yard and I know you are supposed to move all outdoor items in a hurricane so they don’t become projectiles. Will our wind warrant such action at this time? I did already move lighter items. Eric, I’ve asked my wife if I can marry you and she is thoughtfully considering. Thank you for this straightforward, transparent, and responsible website. Eric- do you expect Harvey’s landfall will give the storm surge in Galveston a chance to recede before the really heavy rains hit? Two weeks ago the county rain gauge recorded 4 inches of rain in less than an hour. We are about to spend 5 days under those conditions. It is possible that somewhere will receive unprecedented rainfall totals. Head the advice a prep. If you are in a flood pron zone, have plans to leave if you happen to be that unlucky person. Is it time to evacuate Katy? Lol, sorry old joke. Thanks again for all your work, you’re truly a treasured service to the Houston community. How likely are we to see tornados with this system, either with the earlier outer bands this weekend or when the storm proper passes closer to our area later? I’m seeing a lot of mention of the possibility of them on the news. You haven’t mentioned them at all, and I trust your forecast more than all the hype. THANK GOD Houston has you. If only we could clone you and put you in every city. Thank you for everything especially the regular updates and letting us know approximations of when the next update is coming. I am new to Houston. Is the medical center area prone to horrific flooding and road shutdowns due to flooding? You’re welcome. The Medical Center hardened itself after Allison, so theoretically it should be significantly better off this time. Thank you so much for being a voice of reason and clarity right now. Do you recommend people in the Montrose area leave or stay put and not clog up the roads for people in immediate danger? From a retired English teacher — I’m impressed every day at the quality of the writing in each of your posts. Do y’all have an editor, or do you edit your own pieces? Either way, it’s nice to read clear, concise thoughts written in longer, complex sentences. I know you have too many questions to answer, but concerned about my son who lives off of N. Wilcrest Dr. in a 4th floor apartment. Should they stay put and just be prepared to be stuck for several days? Or better off getting out of the city. Thanks Eric for the calm and objective reporting. http://www.spacecityweather.com is my go-to page for the weather, all year ’round! Southampton near Rice university never flooded and houses are quite elevated…any suggestions? Thanks for all your valuable insight Eric! I know you have quite a few questions being asked, but I’m just concerned about my son that lives in a 4th floor apartment on N. Wilcrest right on the Katy Freeway. Not sure if it’s best for them to just stay put and be prepared to be stuck for several days or get out of town. Any thoughts how bad it will get in the Tomball/Magnolia area? We are literally only just getting back on our feet again after the Tax Day and Memorial Day floods last year and a repeat of same now would be catastrophic for us. 1st and foremost, thank you for your expertise and ability to clearly present the facts. Question: What are the odds the center of Harvey returns to (or stays in) the gulf? Is there a concern that Harvey makes a second Texas landfall as a hurricane? This time closer to Galveston. Worried about Houston conditions early next week when Harvey moves northeast. Eric, thanks so much for the coverage! I was considering driving out to Austin around 11 am – would you anticipate issues with road conditions? I just sent your site to a couple of friends who either live in Houston or have family there and who came to me panicked due to some misinformation on other sites. Thank you for putting the facts out there in a no-nonsense way. It’s going to be bad enough as it is. I’m in Lake Jackson…should I evacuate? Thanks for the updates, Eric. I’m hoping you are correct in that there are no power outages in Houston – I can handle being trapped in my apartment for a few days, but without a/c it will be dicey! Also, if Harvey effects the Game of Thrones finale, it will officially be the worst storm ever. The Cypress (290&99) area, is that likely to get the high digits on rain or low teens? That would be a Biblical flood indeed, but thankfully it is nonsense. Unfortunately this is the type of wrong-headed thinking that the news media both use in their reports and cultivate in their viewership. Thank you Eric for your clear presentation of the facts and their implications. 4″ of rain per day is 20″ of rain in a 5 day period, not 480″! Which area will most likely experience more flooding….Westheimer/Gessner or Cinco Ranch? Trying to make a decision on where to go for next few days. Having not been here for any major storms in recent years, and being relatively new to flood threats, when you say homes will flood and streets are impassable, are you thinking minimal water that could enter the home or life threatening amounts that could fill your home? Just trying to figure out the lingo. We’re down in League City if that helps. Last I heard, Eric is the father of two cute kids and has an adorable wife. But he’s still awesome with his mad meteorology skills. Thank you so much for posting these updates and all of the weather blog in general, just found you this week. So nice to have a reliable local weather source that is not on a TV station that’s just trying to increase ratings. Will travel from Dallas to Houston be attainable tomorrow afternoon with an expected departure of DFW around 2 PM? “Depth of water above the ground” – Does this refer to above the highest point of ground in a certain area or above the average tide line? Our home is in Jamaica Beach and ground level is right at 7′ ASL. Hi, I’m new to your site. It’s become my “more calm” way to deal with this storm. I’m usually a runner but have chosen to stay. That being said, I live in Clear Lake one block near our med center. Nassau Bay and Clear Lake (water) is very close. We are concerned since Nassau Bay was added to the rise in waters (2-4ft). Does that mean a evacuation is a concern? No, I don’t think you should evacuate unless your home is right on the water, and only a few feet above the water. Rising floodwaters may be a concern early next week, but that is a different animal from storm surge, and there are places close by where you can reach higher ground. Can you please tell me if I should leave. My husband is saying we don’t have to leave. I’m close to Chocolate Bayou. I live in Pasadena, pretty much right on Fairmont/Edgebrook, this house hasn’t flooded once since construction 50 some odd years ago, but it is hard to stay logical with a forecast this severe combined with living in a single story house. Ultimately I have to decide to stay or go very soon, do you think homes will flood here, and will power be a huge issue like with Ike? I also have family in La Porte and am worried about them as they are closer to the water, however they have never flooded as well and live in a 3 story house. I am debating urging them to come here. I really appreciate the detailed analysis you are providing. I’m wondering what we might expect in Sugar Land? I’m still trying to decide whether to take my kids and head to Dallas before the heavy rains arrive on Saturday evening. Any thoughts regarding the advisability of travelling on 45N during the next 24 hours? That timeframe should be fine for driving on the freeway. Do you think the roads will be okay to drive into Houston from Dallas on Sunday morning? We are planning to go to the Texans-Saints game in New Orleans and want to leave by around 1 pm today…what are the chances of us making it back on Sunday, or will the flooding along the way keep us out? What do you think will the situation be in Spring Branch close to the Addicks Reservoir? I live west of Houston south of I10 and was wondering how strong the winds will be and if chances of power outages are low? Thanks for all your updates . same here! first hurricane for us, so curious whether we will keep power. we’re at westpark tollway + eldridge. Any advice for flying into iah on Thursday? I’m most worried about how long the power may be out. I’m near 249 & Spring Cypress. The last time we had a storm come through anywhere near this strong the power was out for a week. I have my grandparents living with me and they are in their 80s. So I’m hoping we don’t have another week+ of no power from this storm with the heat the way it is. Eric, you were the wisest voice on NPR this morning – good job! I’ve lived on Galveston Bay in Seabrook for 22 years, and you are the best source of tropical storm information that we’ve ever had. Thank you! One question: in this post you used the term “depth of water above the ground.” I don’t understand that benchmark, since ground level varies by many feet here. What does it mean? We are accustomed to a tidal mark. My grade on Todville Road is 8.5′ above mean high tide, for example, so a surge of 2-4′ above high tide I could estimate, but I don’t know how to interpret an above ground measurement. I was unreasonable excited to hear you on NPR this morning. Thankyou for continuing to provide clear posts! What do you think about flooding in the inner loop areas like Montrose, midtown, and the Museum District? Thank you for the sane and calm and cool and TERRIFIC job of communicating. Channels 2, 11, 13, 26 should all pool the weather and have you as their on the air personality. Then maybe we wouldn’t have all of the craziness that comes from our local weather “experts” on tv. This is the worst I have seen in my 62 years living in Houston. People have lost their collective minds. Thanks again for keeping things sane. Can you predict sustained wind speed in Brenham area? I am arriving IAH around ten p.m. tomorrow, Saturday. I was wondering if you believe it would be better to change to an earlier flight so I don’t get cancelled. I work at a hospital so I’d rather be in town for any possible major events rather than stuck out of town. Also, I can stay at one of two places, Willowbrook area or Atascocita area, both north of the loop; which of these areas do you believe is more safe against flooding? Only lived here five years ago I am unsure. For those evacuating, is Livingston far enough away to be considered safe from flooding ? Thank you I was referred to your site by a PR friend in Houston. I am monitoring Houston weather from CO. It certainly has calmed me down some. will the roads in galveston still be passable after the storm surge? projected 4ft? While looking online for a Houston forecast, trying to avoid the hype-laden news and weather outlets I thought I would take a chance on this site which was totally unknown to me. BEST DECISION OF THE YEAR! Your site is now set as a ‘favorite’ in my browser and will be my ‘go to’ source. Reliant – Very good use of your funds!